Fortunately, not a comedy of errors. I signed up for this race with an ulterior motive. I didn’t want to feel pressured to go out and party on my birthday, so I signed up to race the day after I turned 25! I couldn’t have asked for better weather, better support and teammates, or a better birthday. This was our gorgeous backdrop. This is the start to my second season of triathlon! 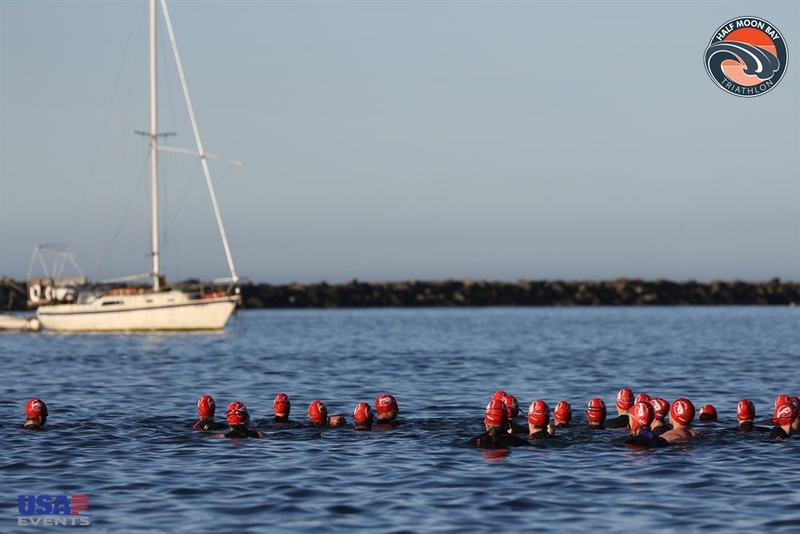 As a birthday race, it also marked the start to a new age group. After the race, I was actually really happy to have been in the 25-29 age group, because there was only one woman in the 20-24 group. I was nervous for the competition, excited to see how I’d do, and really just thrilled to be back on the race course. If you haven’t figured out that my birthday was this weekend yet, you’re clearly not paying attention. My mom offered to pay for a hotel stay (across the street from transition!) as my birthday present – and boy am I grateful, because Half Moon Bay hotels are expensive. I’m also thrilled that I didn’t have to deal with morning-drive logistics. We arrived to the Saturday packet pickup/vendor expo and were a little surprised that there were very few vendors there – since we were staying the night, I would have happily putzed around talking to people, but it was fine we didn’t. We hung out by the water, got lunch, hung out and took a nap, and then went to dinner, celebrating with a glass of Prosecco…and then another glass of wine. I’ve had a glass of chardonnay before every race, but strictly one – I’d say I’m disciplined, but hey, birthday bubbly! The alarm went off at 4:55, took care of business, got dressed, and rolled across the street. 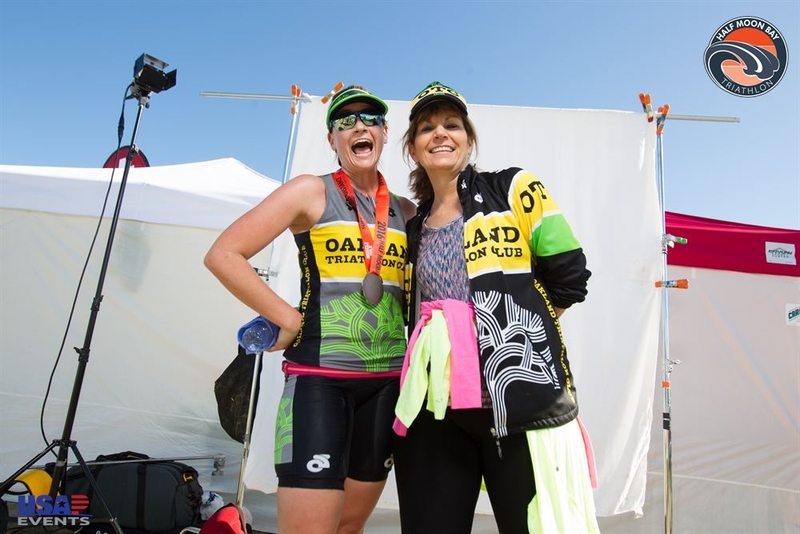 I love that USA Productions provides a dedicated rack to tri clubs with more than five racers – it makes our lives way easier, and is definitely a huge benefit to being a club member! I had heard this swim was cold, and ya, people weren’t kidding. Fortunately, I just won a new BlueSeventy Reaction wetsuit during the Slowtwitch Roadshow in Berkeley – I have sleeves now!! Made for a much warmer race. 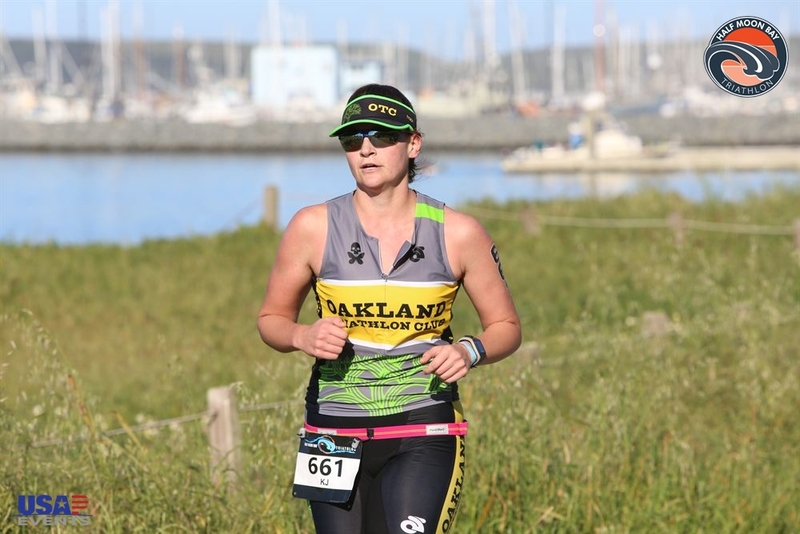 The swim was pretty uneventful – short, two turns and a sprint in to the arch. Not much jostling because the young men from a youth triathlon club lined up at the wrong side of the start, so the one other guy on the left side of the start and I didn’t have their traffic to deal with. Just like at the Oakland Triathlon Festival, we had the option to bring shoes down to the swim exit. I didn’t have any issues shoe-less at Oakland, but I kind of wish I had some for this race. Oakland had a few rough pavement patches, but on average was very smooth. Half Moon Bay was just, on average, rougher. I definitely am in the process of losing a callus from the run. I’m a little bummed that there weren’t timing mats coming out of the swim. 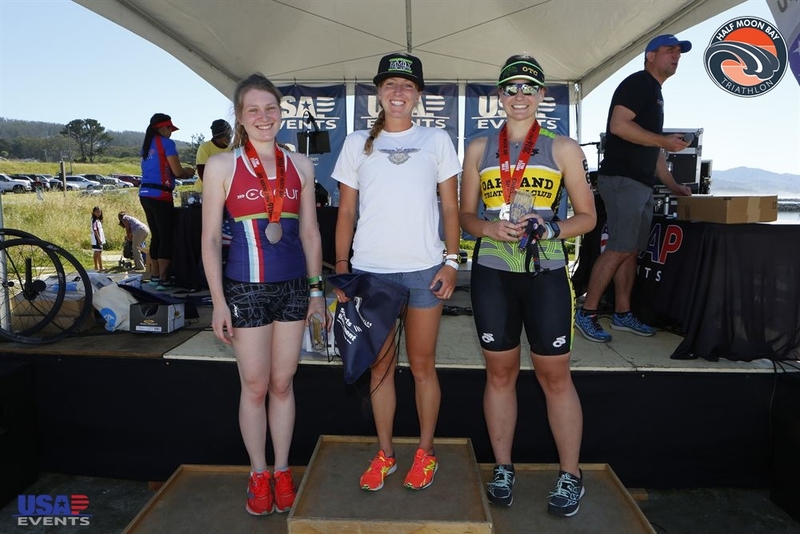 I was definitely the first woman out of the water, but was passed during the run to T1 – all 1/3 of a mile of it – by two other women, one the overall winner. Things to work on: learn how to take off a sleeved wetsuit. 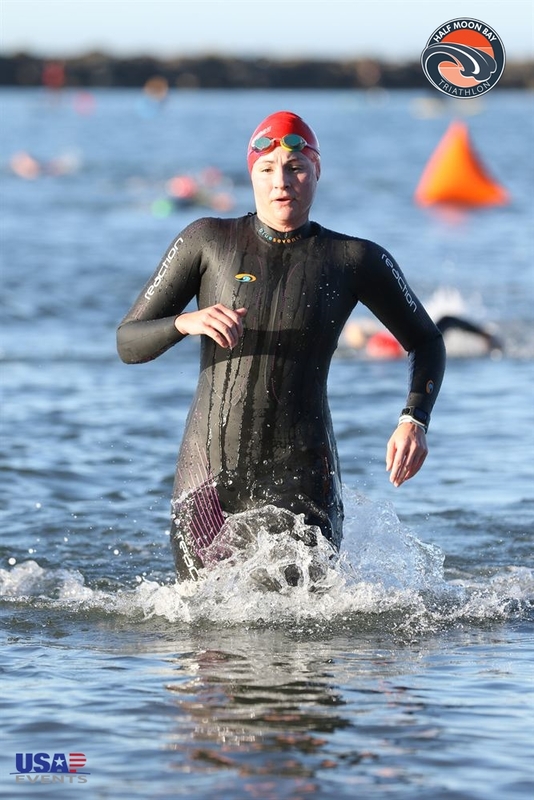 I ran with my hands inside the wetsuit most of the way to transition!! Next time, it’s one arm off, one arm on, fingers inside the sleeve, then switch. Not both arms off simultaneously -_-. I did really like that they set up a U-Turn transition – one in, one out, just like at Morro Bay. I hinted at one of the main guys from USAP that they may have an issue with traffic because they weren’t going to switch sides, but he said only the fast people would have that problem. Ehhhhh not quite. 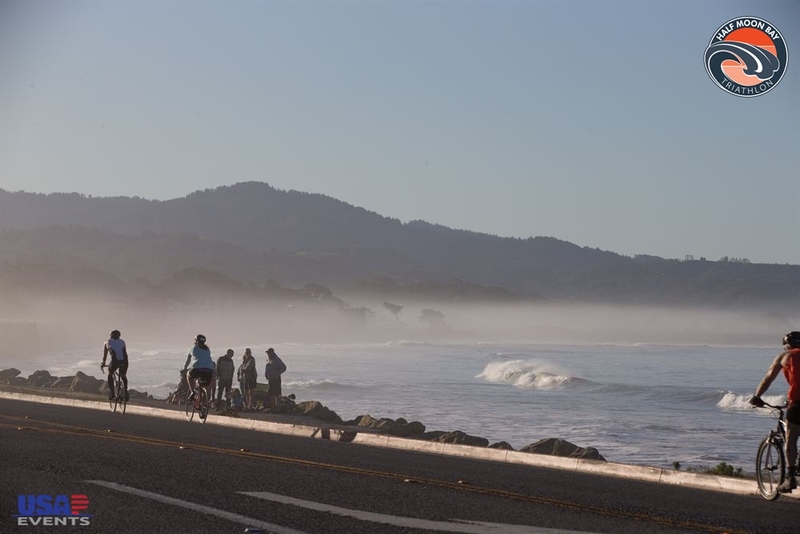 I love coastal rides. I probably should stop doing them because I’m easily distracted by the ocean, but it was a gorgeous course. There was one 50 yard section of construction that should have been noted as a no-pass zone (it wasn’t), but I somehow caught a guy in it and slowed from 18 mph to 7 mph…wasn’t thrilled about that one. I also wasn’t thrilled to see the pace groups that formed. One massive pack passed me, all but the leader two abreast and on each other’s wheels. I think the leader just happened to be the guy they caught and were all drafting from – I don’t think he was part of that group. 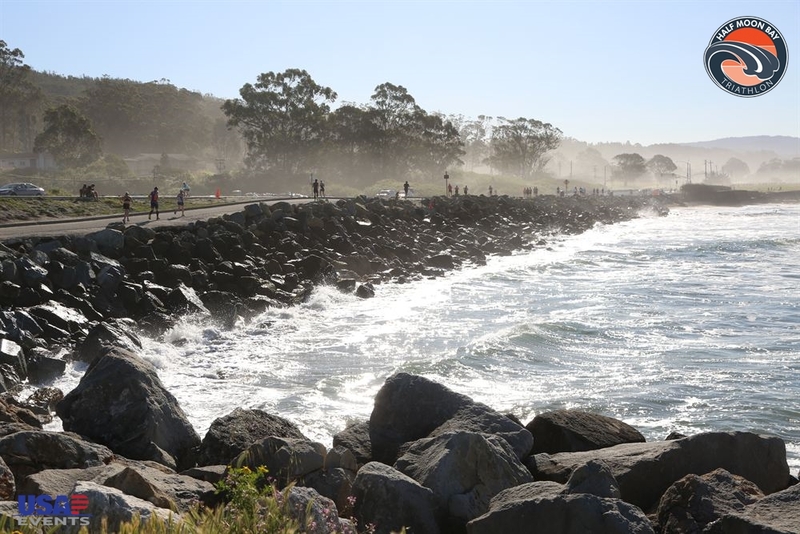 Triathlons give you an excuse to visit the most beautiful places. Another guy passed me on a nice straight, flat section of highway – which gave me a great view to watch him weave back and forth from the shoulder to the lane after every car that passed, effectively grabbing the draft from the vehicle. Not safe, not cool, and hopefully he spent just as much energy output to cover the extra mileage as he gained in drafting the cars. I saw one of my teammates not too long after the first turn around, and all I thought to myself was, don’t let her pass you!! Obviously I want everyone to have a great race, but I knew I had three minutes from the wave start on her, and she’s a great cyclist (and even better runner). So for me to have a good bike leg, I needed to stay in front of her. And I did! I don’t always like to say “I told you so,” but I definitely had the opportunity to say it here: I am not super fast, and I had to deal with traffic congestion between the bike in/run out here. Fortunately it was quick, everyone around me was aware and polite (hopefully they thought I was too). Racked my bike, swapped my shoes, helmet became visor, and I was off. Start of the run serious face. Didn’t last long. If you know anything about me, you know that running…isn’t really my thing. My teammate caught me maybe 0.1 miles out of transition – fantastic! Goal achieved, she was flying, and I didn’t see her until the finish. Rockstar. However, I think my off-season running has started to pay off. I checked my watch after passing the first pack of OTC volunteers, and I was down in the 7:00 min/mile range. I knew that was too fast so I backed off a bit, and stayed under 9:00 for most of the rest of the race! I was having a great time, had some quick conversations with people, scared a volunteer (pointing at people and telling them you’re coming for them I guess is a little intimidating? ), and laughed at some boxers hanging out by the course. Hands down the most flattering picture of me running. Ever. As I approached the original first group of OTC volunteers (now the last group), I was so stoked that my pace increased to a high 6 min/mile – right as I was heading up a slight incline towards transition and the finish. I was feeling great – up until I wasn’t. My stomach lurched, I gagged, and one of my teammates caught me (same teammate who caught me at Oakland. New goal: don’t let Steve catch you on the run). He encouraged me, wanted me to sprint the last 0.25 (if that), and I literally said, “Nope, gonna puke” – I guess my subsequent gag convinced him and he left. So… I apologize if you were watching on the hill above the finish chute, because I did have to get something out. It wasn’t toward you, but I saw your faces and I know you knew what I had done. It didn’t feel good. Fortunately, as soon as that slight incline crested, I felt a million times better and sprinted in to the finish for a sub-1:19 finish. Whoo!!! Me and the best sherpa ever (love you, Mom!)! I am so happy with my race. I had a lot that I can improve on, and I had a few confidence boosters too. Practicing with the new wetsuit, maybe actually doing some bricks before my next race, maybe a little speed work… a lot can get better. A goal of mine this season is to not leave anything on the course. 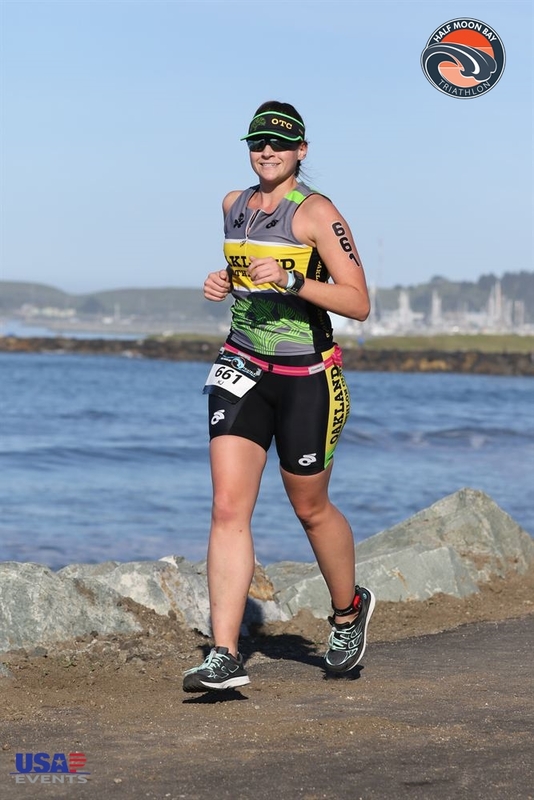 Last year, I had to learn my body, learn how to race, and learn a whole lot of stuff about triathlon. This year, I think a lot more can come together! I will never NOT be excited for a podium finish. Let’s go 25-29!!! 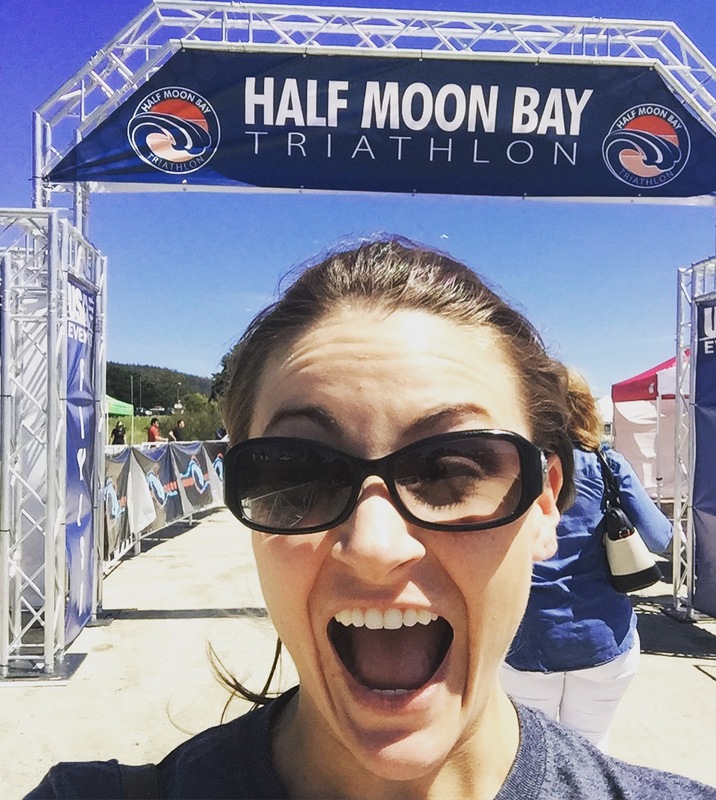 Next Next post: Monte Rio Sprint Tri 2016: Or, my race plan went to hell.